Rio Grande’s Devon Price attempts a wrap-around pass to teammate Stanley Christian during Tuesday afternoon’s 91-70 win over Ohio University-Lancaster in the 5th Annual Champions of Character Classic at the Newt Oliver Arena. The RedStorm improved to 6-9 with the victory. RIO GRANDE, Ohio — Maybe it was playing a third game in four days. Maybe it was the fact that the Christmas break was to begin immediately after the game was over. Whatever the reason, though, Tuesday afternoon’s 5th Annual Champions of Character Classic didn’t go as smoothly as one may have thought it would for the University of Rio Grande men’s basketball team. 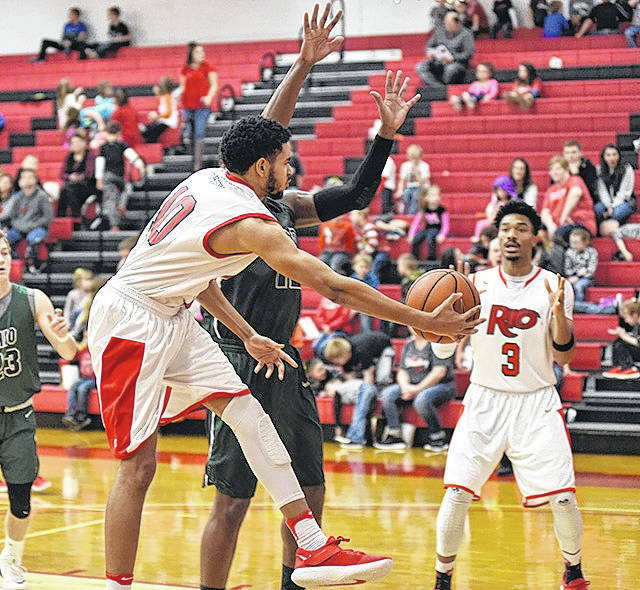 The RedStorm did, however, find a way to overcome a slow start and pulled away for a 91-70 win over Ohio University-Lancaster in front of a boisterous Newt Oliver Arena crowd comprised mostly of students from Rio Grande Elementary School. Rio Grande improved its overall record to 6-9 with a second straight win in games that count toward the season ledger. The RedStorm had suffered an exhibition loss at NCAA Division I Miami-Ohio on Sunday. OU-Lancaster had a modest two-game winning streak snapped and slipped to 5-10 with the loss. The Cougars actually led by five points just under four minutes into the contest and were still within three points, 38-35, after a pair of Preston Gothard free throws with 2:47 remaining in the first half before Rio finally grabbed control. The RedStorm went on a 19-4 run, which bridged the final 2:22 of the first half and the opening 4:15 of the second period, to take a 57-39 lead after a bucket by senior Will Hill (Worthington, OH) and OU-L got no closer than 14 points the rest of the day. Rio’s biggest lead of the day was 29 points, 81-52, following a rebound and stickback by sophomore Stanley Christian (Norfolk, VA) with 8:58 left in the game. Christian had 15 of his game-high 23 points and six of his game-high 13 rebounds after halftime. Hill was the only other double-digit scorer for the RedStorm, netting 18 points to compliment a game-high six assists. Eleven of the 13 players in uniform for Rio scored in the victory. The RedStorm got the win despite hitting just six of their 27 three-point attempts, going an uncharacteristic 13-for-22 at the free throw line and committing 16 turnovers. Rio did shoot 44 percent from the field overall (36-for-81) and enjoyed a whopping 59-34 edge in rebounding. OU-Lancaster, which had nine players of its own score, was led by Preston Gothard’s 18-point, six-rebound effort off the bench. Gavin Eberhardt and Sean Higgins totaled 11 points each in a losing cause for the Cougars, who went just 5-for-28 from three-point range themselves. Rio Grande will now enjoy a 10-day holiday break between games before hosting Truett-McConnell (Ga.) on Friday, Dec. 29, at 4:30 p.m.